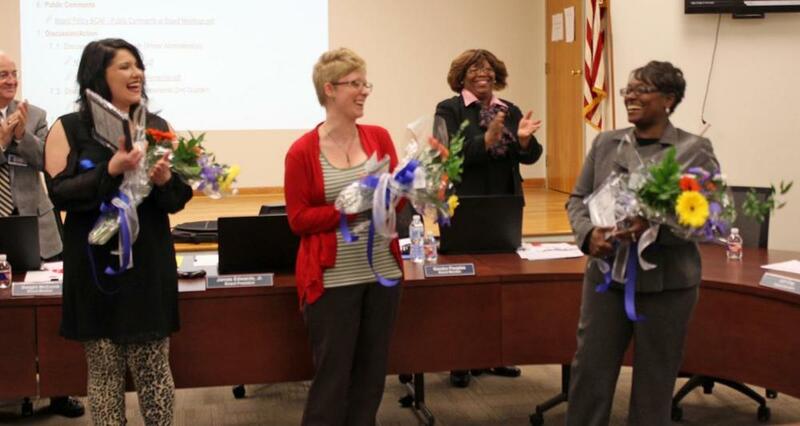 ABERDEEN – As part of Jan. 18’s Aberdeen School Board meeting, the district’s three top teachers of the year were recognized for their accomplishments in education. Amanda Rogers was selected as the Aberdeen Elementary School Teacher of the Year, Amanda Jencik is the Belle-Shivers Middle School Teacher of the Year, and Tracy Fair was selected as not only the Aberdeen High School Teacher of the Year but the district’s teacher of the year. “I am honored and shocked, but this is truly a blessing. I appreciate the teamwork because I can’t do anything by myself. The Lord has blessed me on the right path. I’ve been surrounded by a great team all the years I’ve worked here,” Fair said. In other recognitions, Aberdeen Elementary School third-grade teacher Terrie Walls was recognized as being a national LifeChanger of the Year nominee. The award is through the National Life Group Foundation. Belle-Shivers Middle School students Emileigh Matthews, Aaliyah Taylor and Tamia Baker were recognized for winning their school’s spelling bee. They’ll represent the district in the county spelling bee Jan. 25 at 6 p.m. at the Hatley dome. In other business, the board approved the district’s 2018-2019 calendar. Teacher professional development begins on Aug. 1, and classes will begin Aug. 6, which is on a Monday. Students will have Oct. 5, 8 and 9 off for fall break, and winter break will be Dec. 20 through Jan. 4. Spring break will be March 11-15, and graduation and the last day of class will be May 23. “We tried to put enough breaks in there so they’ll go 20 student days before they get Labor Day, then 24 days and we’ve got a fall holiday with Columbus Day,” said superintendent Jeff Clay. For the next calendar year, Jim Edwards will maintain his office as school board president, and Patrick Lockett will continue to serve as board secretary. Clay informed the board the school district received a matching grant of $20,000 from the Mississippi Department of Education for the MCOPS program to defray costs associated with school resource officers. In other business, the board approved for Clay to attend a comprehensive literary summit in Palm Springs, California through Scholastic. Scholastic is paying for airfare, hotel accommodations and meals. There will be two meetings for next school year’s incoming freshmen about new graduation options on Feb. 6 and Feb. 22 at 5:30 p.m. at the Aberdeen High School Little Theatre. Talk about career and technical options through the upcoming Mississippi diploma options led to Clay saying he is working with Monroe County Chamber of Commerce Executive Director Chelsea Baulch about building a workforce through the school. “There are a couple of new grants out there for 11th- and 12th-graders. They’re partnering with industries and trying to identify students put into these programs, and they’ll pay for these salaries, and we’ll be a worksite partner,” said Lockett, who works at Tronox. He said the same program will follow the same students through their first two years of college.